The Church is located downtown, at the corner of Betts and Darlington, 1 block from the Court House. 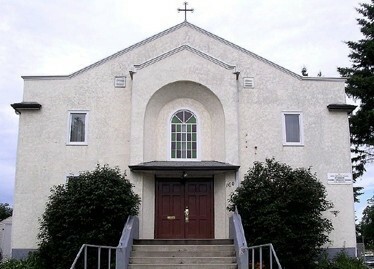 St Mark’s parish was organized in 1987 to meet the needs of Orthodox people living in the area who wanted an English language, new calendar, active community. Since the early 1900’s many OCA parishes were organized in the farming communities around Yorkton. Presently attached to St Mark’s are 13 chapels and graveyards. This new parish became the centre for people moving into the city, as the rural areas decline in population. In 1990 along with the Greek Mission the community acquired a church building that needed to be converted for Orthodox worship. The Greek community of Yorkton has services once a month (during the week) to supplement their spiritual needs. Thus the community of St Mark (OCA) and Ss Anargyroi (Greek Orthodox Church) function as one parish in our daily life, yet under two diocese administratively. We are 65 households, some from the traditional Orthodox backgrounds: Ukrainian, Romanian, Greek, as well as converts to Orthodoxy.